CommitCRM certainly isn’t exactly short of places to enter data about customers and there is a wide array of boxes and forms designed to enter all manner of information. However there is a pretty much infinite variety of data which could be collected and stored about customers and sometimes you may find yourself trying to put a square peg in a round hole. Fortunately there is now a solution for the square peg problem – Structured Notes! The ability to easily store your custom Account data is what a Structured Note provides. 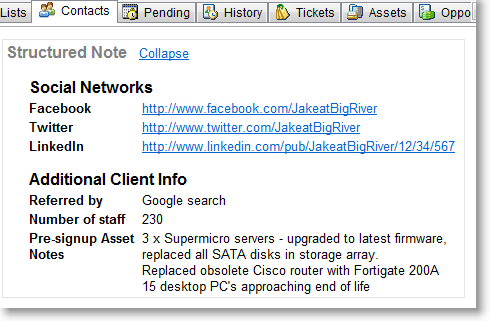 Your Structured Note sections can contain any text data you want and you can have as many sections as you need. Structured Notes for Accounts are in fact very similar to Configuration Notes which have been available in the Assets module for some time already. 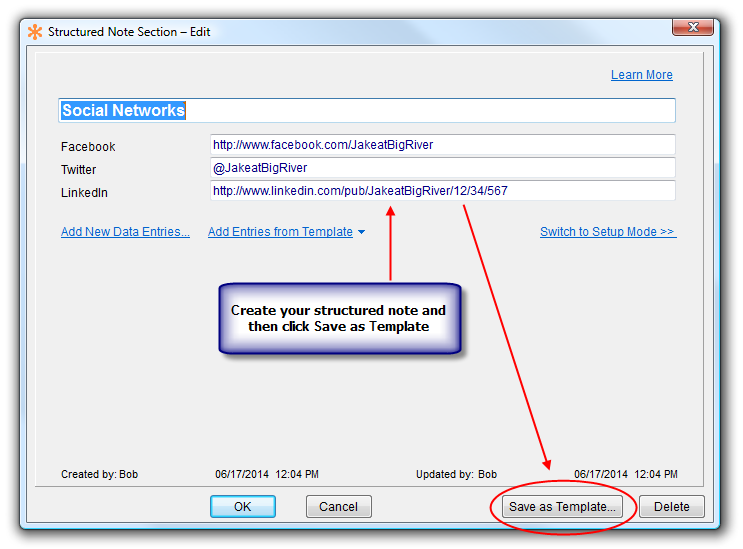 By using the Structured Note for an Account, you can create any number of sections to store your custom data. For example, say you wanted to store the social network profile links of your customer and of the various contacts within their company, now you can do that easily with a “Social Networks” section in a Structured Note. Have a line for each network such as Facebook, LinkedIn and any others you want to store, and you can then simply add that data whenever you have it. Chances are you will want to have the same data structure for Social Networks (or whatever else you want) stored under every Account or at least more than one Account and you won’t want to be recreating a Structured Note section every time. Luckily you can use templates to rapidly create a new section under another Account. The template can be complete with values as well as field names, or it can be just the field names, with the values blank for filling in with data specific to that Account. 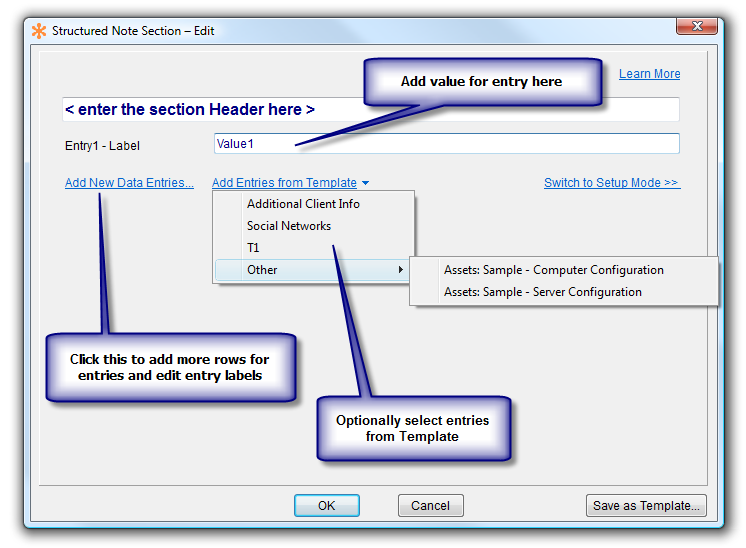 Structured Note sections can be created with several types of value field. A simple text field for adding a single line of text, a memo field which can be used for adding multiple lines of text, and finally a values selection list which can be used to select data from any existing values list in CommitCRM. Being able to store loads of custom data in a Structured Note is no doubt useful, but what happens when you need to find some data stored in there? No problem! You will see now on the usual Find/Search bar, there is a new option for Structured Note in the drop down list of fields to search which makes it very easy to find any data you have stored there. Knowledge is power and the new Structured Notes for Accounts feature enables you to add (and retrieve) even more knowledge to your Professional Services Automation application. We hope you find it beneficial in your business.